Teresa de Ahumada y Cepeda was born in Avila, Castile, Spain, on March 28, 1515. Her paternal grandfather, Juanito de Hernandez, was a marrano (Jewish convert to Christianity) and was condemned by the Spanish Inquisition for allegedly returning to the Jewish faith. Her parents were of a very high estate, her father, Alonso Sánchez de Cepeda, was a rather wealthy merchant. He bought a knighthood and successfully assimilated into Christian society. He was rigidly honest and pious, but he may have carried his strictness to extremes. Teresa's mother, Beatriz de Ahumada y Cuevas, loved romance novels but because her husband objected to these fanciful books, she hid the books from him. This put Teresa in the middle—especially since she liked the romances, too. Her father told her never to lie, but her mother told her not to tell her father. Later she said she was always afraid that no matter what she did she was going to do everything wrong. Teresa was the "most beloved" among her nine brothers and sisters. From her youth, Teresa showed great zeal and piety, as well as courage. Teresa was considered by all those around her to be quite beautiful. Plus she had an irresistible charm, a sharp wit, a kind nature, and much enthusiasm. Everyone loved to be around her. She was skilled in embroidery, wonderful at housekeeping, and a rather excellent writer. When she was five years old, she convinced her older brother that they should, as she says in her Life, "go off to the land of the Moors and beg them, out of love of God, to cut off our heads there." They got as far as the road from the city before an uncle found them and brought them back. Some people have used this story as an early example of sanctity, but some think it's better used as an early example of her strong will. After this incident she led a fairly ordinary life, though she was convinced that she was a horrible sinner. When Teresa was 14 her mother died, and Teresa became grief-stricken. This prompted her to embrace a deeper devotion to the Virgin Mary as her spiritual mother. Along with this good resolution, however, she also developed immoderate interests in reading popular fiction (consisting, at that time, mostly of medieval tales of knighthood and romance), paying great attention to her appearance and her clothing, flirting with boys, and rebelling—like other teenagers throughout the ages. When she was 16, her father decided she was out of control and sent her to a convent. At first she hated it but eventually she began to enjoy it—partly because of her growing love for God, and partly because the convent was a lot less strict than her father. Still, when the time came for her to choose between marriage and religious life, she had a tough time making the decision. She'd watched a difficult marriage negatively affect her mother. On the other hand, being a nun didn't seem like much fun. When she finally chose religious life, she did so because she thought that it was the only safe place for someone as prone to sin as she was. Once installed at the Carmelite convent permanently, she started to learn and practice mental prayer, in which she "tried as hard as I could to keep Jesus Christ present within me. My imagination is so dull that I had no talent for imagining or coming up with great theological thoughts." Teresa prayed this way off and on for eighteen years without feeling that she was getting results. Part of the reason for her trouble was that the convent was not the safe place she assumed it would be. Many women who had no place else to go wound up at the convent, whether they had vocations or not. Nuns were encouraged to stay away from the convents for long period of time to cut down on expenses. They also arranged their veils attractively and wore jewelry. Prestige depended not on piety but on money. There was a steady stream of visitors in the convent parlors and parties that included young men. What spiritual life there was involved hysteria, weeping, exaggerated penance, nosebleeds, and self- induced visions. Teresa suffered the same problem that Francis of Assisi did—she was too charming. Everyone liked her and she liked to be liked. She found it too easy to slip into a worldly life and ignore God. The convent encouraged her to have visitors to whom she would teach mental prayer because their financial gifts helped the community economy. But Teresa got more involved in flattery, vanity, and gossip than in spiritual guidance—all of which kept her from God. Then Teresa fell ill with malaria. She had a seizure, and people were so sure she was dead that after she woke up four days later, she learned they had dug a grave for her. Afterwards she was paralyzed for three years and was never completely well. Yet instead of helping her spiritually, her sickness became an excuse to stop her prayer completely: she couldn't be alone, she wasn't healthy enough, and so forth. Later she would say, "Prayer is an act of love, words are not needed. Even if sickness distracts from thoughts, all that is needed is the will to love." For years she hardly prayed at all "under the guise of humility." She thought that, as a wicked sinner, she didn't deserve to get favors from God. But turning away from prayer was like "a baby turning from its mother's breasts; what can be expected but death?" She experienced periods of religious ecstasy through the use of the devotional book, Third Spiritual Alphabet (published in 1527 and written by Francisco de Osuna). This work, following the example of similar writings of medieval mystics, consisted of directions for examinations of conscience and for spiritual self-concentration and inner contemplation (known as oratio recollections or oratio mentalis). She claimed that she rose from the lowest stage, "recollection," to the "devotions of silence" or even to the "devotions of ecstasy," which was one of perfect union with God. During this final stage, she said she frequently experienced a rich "blessing of tears." As the Catholic distinction between mortal and venial sin became clearer to her, she says she came to understand the awful terror of sin and the inherent nature of original sin. She also became conscious of her own natural impotence in confronting sin, and the necessity of absolute subjection to God. However, she expressed that she found prayer difficult. "I was more anxious for the hour of prayer to be over than I was to remain there. I don't know what heavy penance I would not have gladly undertaken rather than practice prayer." She was distracted often: "This intellect is so wild that it doesn't seem to be anything else than a frantic madman no one can tie down." Teresa sympathizes with those who have a difficult time in prayer: "All the trials we endure cannot be compared to these interior battles." Yet her experience gives us wonderful descriptions of mental prayer: "For mental prayer in my opinion is nothing else than an intimate sharing between friends; it means taking time frequently to be alone with Him who we know loves us. The important thing is not to think much but to love much and so do that which best stirs you to love. Love of God is not great delight but desire to please Him in everything." In time, God gave her spiritual delights during prayer: the prayer of quiet where God's presence overwhelmed her senses, raptures where God overcame her with glorious foolishness, prayer of union where she felt the sun of God melt her soul away. Sometimes her whole body was raised from the ground. If she felt God was going to levitate her body, she stretched out on the floor and called the nuns to sit on her and hold her down. Far from being excited about these events, she "begged God very much not to give me any more favors in public." In her books, she analyzes and dissects mystical experiences the way a scientist would. She never saw these gifts as rewards from God but instead as the way He "chastised" her. The more love she felt, the harder it was to offend God. She says, "The memory of the favor God has granted does more to bring such a person back to God than all the infernal punishments imaginable." Her biggest fault was her friendships. Though she wasn't sinning, she was very attached to her friends until God told her, "No longer do I want you to converse with human beings but with angels." In an instant He gave her the freedom that she had been unable to achieve through years of effort. After that God always came first in her life. Some friends, however, did not like what was happening to her and got together to discuss some "remedy" for her. Concluding that she had been deluded by the devil, they sent a Jesuit to analyze her. The Jesuit reassured her that her experiences were from God but soon everyone knew about her and was making fun of her. One confessor was so sure that the visions were from the devil that he told her to make an obscene gesture called the fig every time she had a vision of Jesus. She cringed but did as she was ordered, all the time apologizing to Jesus. Fortunately, Jesus didn't seem upset but told her that she was right to obey her confessor. In her autobiography she would say, "I am more afraid of those who are terrified of the devil than I am of the devil himself." The devil was not to be feared but fought by talking more about God. Teresa felt that the best evidence that her delights came from God was that the experiences gave her peace, inspiration, and encouragement. "If these effects are not present, I would greatly doubt that the raptures come from God; on the contrary, I would fear lest they be caused by rabies." On St. Peter's Day in 1559, Teresa became firmly convinced that Jesus Christ presented Himself to her in bodily form, though invisible. These visions lasted almost uninterrupted for more than two years. In another vision, later called the Transverberation, a seraph drove the fiery point of a golden lance repeatedly through her heart, causing an ineffable spiritual-bodily pain. “I saw in his hand a long spear of gold, and at the point there seemed to be a little fire. He appeared to me to be thrusting it at times into my heart, and to pierce my very entrails; when he drew it out, he seemed to draw them out also, and to leave me all on fire with a great love of God. The pain was so great, that it made me moan; and yet so surpassing was the sweetness of this excessive pain, that I could not wish to be rid of it...” This vision was the inspiration for one of Bernini's most famous works, the Ecstasy of Saint Teresa at Santa Maria della Vittoria, which is now in Rome. The memory of this episode served as an inspiration throughout the rest of her life, and motivated her lifelong imitation of the life and suffering of Jesus, epitomized in the motto usually associated with her: Lord, either let me suffer or let me die. Sometimes, however, she couldn't avoid complaining to her closest Friend about the hostility and gossip that surrounded her. When Jesus told her, "Teresa, that's how I treat my friends," Teresa responded, "No wonder you have so few friends." But since Christ has so few friends, she felt they should be good ones. And that's why she decided to reform her Carmelite order. The incentive to give outward practical expression to her inward motive was inspired in Teresa by the Franciscan priest Saint Peter of Alcantara who became acquainted with her early in 1560, and became her spiritual guide and counselor. She resolved to found a reformed Carmelite convent, correcting the laxity which she had found in the Cloister of the Incarnation and others. Guimara de Ulloa, a woman of wealth and a friend, supplied the funds. Teresa worked for many years encouraging Spanish Jewish converts to follow Christianity. When plans leaked out about her first convent, St. Joseph's, she was denounced from the pulpit, told by her sisters she should raise money for the convent she was already in, and threatened with the Inquisition. The town started legal proceedings against her. All because she wanted to try a simple life of prayer. In the face of this open war, she went ahead calmly, as if nothing was wrong, trusting in God. At St. Joseph's, she spent much of her time writing her Life. She wrote this book not for fun but because she was ordered to. Many people questioned her experiences and this book would either clear her or condemn her. Because of this, she used a lot of camouflage in the book, following a profound thought with the statement, "But what do I know. I'm just a wretched woman." The Inquisition liked what they read and cleared her. "May God protect me from gloomy saints," Teresa said, and that's how she ran her convent. To her, spiritual life was an attitude of love, not a rule. Although she proclaimed poverty, she believed in work, not in begging. She believed in obedience to God more than penance. If you do something wrong, don't punish yourself--change. When someone felt depressed, her advice was that she go some place where she could see the sky and take a walk. When someone was shocked that she was going to eat well, she answered, "There's a time for partridge and a time for penance." To her brother's wish to meditate on hell, she answered, "Don't." At 51, she felt it was time to spread her reform movement. She braved burning sun, ice and snow, thieves, and rat-infested inns to found more convents. But those obstacles were easy compared to what she faced from her brothers and sisters in religious life. She was called "a restless disobedient gadabout who has gone about teaching as though she were a professor" by the papal nuncio. When her former convent voted her in as prioress, the leader of the Carmelite order excommunicated the nuns. A vicar general stationed an officer of the law outside the door to keep her out. The other religious orders opposed her wherever she went. She often had to enter a town secretly in the middle of the night to avoid causing a riot. In 1567, she received a patent from the Carmelite general, Rubeo de Ravenna, to establish new houses of her order, and in this effort and later visitations she made long journeys through nearly all the provinces of Spain. Of these she gives a description in her "Libro de las Fundaciones." Between 1567 and 1571, reform convents were established at Medina del Campo, Malagón, Valladolid, Toledo, Pastrana, Salamanca, and Alba de Tormes. The help she received was sometimes worse than the hostility. A princess ordered Teresa to found a convent and then showed up at the door with luggage and maids. When Teresa refused to order her nuns to wait on the princess on their knees, the princess denounced Teresa to the Inquisition. In another town, they arrived at their new house in the middle of the night, only to wake up the next morning to find that one wall of the building was missing. Why was everyone so upset? Teresa said, "Truly it seems that now there are no more of those considered mad for being true lovers of Christ." No one in religious orders or in the world wanted Teresa reminding them of the way God said they should live. Teresa looked on these difficulties as good publicity. Soon she had postulants clamoring to get into her reformed convents. Many people thought about what she said and wanted to learn about prayer from her. Soon her ideas about prayer swept not only through Spain but all of Europe. As part of her original patent, Teresa was given permission to set up two houses for men who wished to adopt the reforms; she convinced John of the Cross and Anthony of Jesus to help with this. They founded the first convent of Discalced Carmelite Brethren in November 1568 at Duruello. Another friend, Gerónimo Gracian, gave her powerful support in founding convents at Segovia (1571), Beas de Segura (1574), Seville (1575), and Caravaca de la Cruz (Murcia, 1576), while the deeply mystical John of the Cross, by his power as teacher and preacher, promoted the inner life of the movement. In 1576 a series of persecutions began on the part of the older observant Carmelite order against Teresa, her friends, and her reforms. Pursuant to a body of resolutions adopted at the general chapter at Piacenza, the "definitors" of the order forbade all further founding of convents. The general chapter condemned her to voluntary retirement to one of her institutions. She obeyed and chose St. Joseph's at Toledo. Her friends and subordinates were subjected to greater trials. Finally, after several years her pleadings by letter with King Philip II of Spain secured relief. As a result, in 1579, the processes before the inquisition against her and others were dropped, which allowed the reform to continue. A brief of Pope Gregory XIII allowed a special provincial for the younger branch of the discalced nuns, and a royal rescript created a protective board of four assessors for the reform. 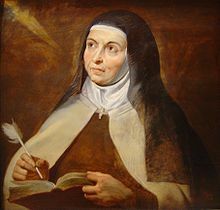 During the last three years of her life, Teresa founded convents at Villanueva de la Jara in northern Andalusia (1580), Palencia (1580), Soria (1581), Burgos, and Granada (1582). In total seventeen convents, all but one founded by her, and as many men's cloisters were due to her reform activity of twenty years. In 1622, forty years after her death, she was canonized by Pope Gregory XV. The Cortes exalted her to patroness of Spain in 1617, and the University of Salamanca previously conferred the title Doctor ecclesiae with a diploma. The title is Latin for Doctor of the Church, but is distinct from the papal honor of Doctor of the Church, which is always conferred posthumously and was finally bestowed upon her by Pope Paul VI in December 27, 1970 along with Saint Catherine of Siena making them the first women to be awarded the distinction. Teresa is revered as the Doctor of Prayer. The mysticism in her works exerted a formative influence upon many theologians of the following centuries, such as Francis of Sales, Fénelon, and the Port-Royalists. Teresa is one of the foremost writers on mental prayer, and her position among writers on mystical theology is unique. In all her writings on this subject she deals with her personal experiences. Her deep insight and analytical gifts helped her to explain them clearly. Her definition was used in the Catechism of the Catholic Church: "Contemplative prayer [oración mental] in my opinion is nothing else than a close sharing between friends; it means taking time frequently to be alone with him who we know loves us." She used a metaphor of mystic prayer as watering a garden throughout her writings. The first, or "mental prayer," is that of devout contemplation or concentration, the withdrawal of the soul from without and especially the devout observance of the passion of Christ and penitence (Autobiography 11.20). The second is the "prayer of quiet," in which at least the human will is lost in that of God by virtue of a charismatic, supernatural state given by God, while the other faculties, such as memory, reason, and imagination, are not yet secure from worldly distraction. While a partial distraction is due to outer performances such as repetition of prayers and writing down spiritual things, yet the prevailing state is one of quietude (Autobiography 14.1). The "devotion of union" is not only a supernatural but an essentially ecstatic state. Here there is also an absorption of the reason in God, and only the memory and imagination are left to ramble. This state is characterized by a blissful peace, a sweet slumber of at least the higher soul faculties, or a conscious rapture in the love of God. The fourth is very, very rare, and is the "devotion of ecstasy or rapture," a passive state, in which the feeling of being in the body disappears (2 Corinthians 12:2-3). Sense activity ceases; memory and imagination are also absorbed in God or intoxicated. Body and spirit are in the throes of a sweet, happy pain, alternating between a fearful, fiery glow, a complete impotence and unconsciousness, and a spell of strangulation, sometimes by such an ecstatic flight that the body is literally lifted into space. This after half an hour is followed by a reactionary relaxation of a few hours in a swoon-like weakness, attended by a negation of all the faculties in the union with God. The subject awakens from this in tears; it is the climax of mystical experience, producing a trance. Indeed, St. Teresa was said to have been observed levitating during Mass on more than one occasion.